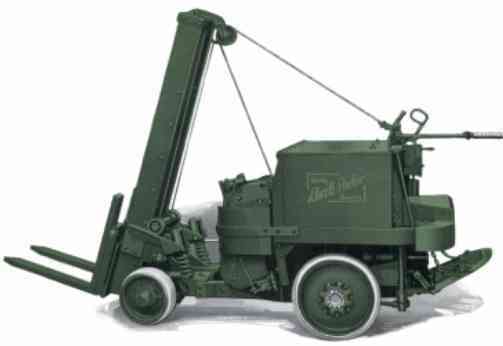 Lift Trucks have come a long way since first being introduced in the early part of the 20th century as can be seen in this early photo of an Ellwell-Parker "Tiering Tructor". Their original purpose, the efficient movement of materials, however has not changed. 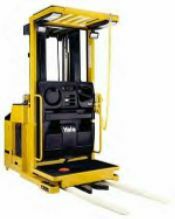 Below I show examples of some of the most common types of lift trucks used in material handling. Since there are numerous configurations and specialty trucks not listed I suggest you check the manufacturers sites for additional info. Also read my articles Lift Truck Basics and The Aisle Width Decision for more info. 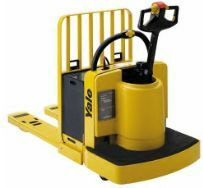 The motorized version of the pallet jack, the rider type (shown) is used for frequent movement of pallet loads over distances such as movement between departments or storage areas. Also comes in a Walkie version that lacks the operator platform and higher speeds. Low cost and high maneuverability make these vehicles a good choice where frequent movement of loads is required. 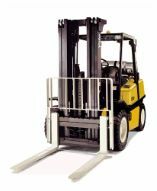 Options include double pallet length forks that allow you to move 2 pallets in one trip. Multipurpose vehicle used to load trailers, stack loads, rack loads, move pallet loads throughout facility. Requires wide aisle for turning (11' or more) Wide variety of attachments available. Electric is strictly indoor vehicle. Electric Forklift. Functionality similar to electric truck above. Propane truck (shown) can be used indoors or out provided there is adequate ventilation. Narrow aisle truck (8'-11') designed specifically for racked pallet storage. Double-deep version (shown) loads pallets 2-deep in special double-deep racking. Mast swings out 90 degrees to facilitate placement of pallets in racking in very narrow aisles (VNA) of less than 6'. Multipurpose functionality also allows it to be used for moving pallets and for loading trailers. Very narrow aisle truck (VNA) allows storage of pallet loads in racking with aisles less than 6' wide. Man-up design facilitates accurate placement in tall racking (up to 40 ft.). This type of vehicle generally requires a guidance system and extremely level floors.